The 32nd IAFF Fallen Fire Fighter Memorial service will be broadcast live via streaming video on Saturday, September 15. The ceremony in Colorado Springs, Colorado, officially begins at 11:00 a.m. Mountain Time. 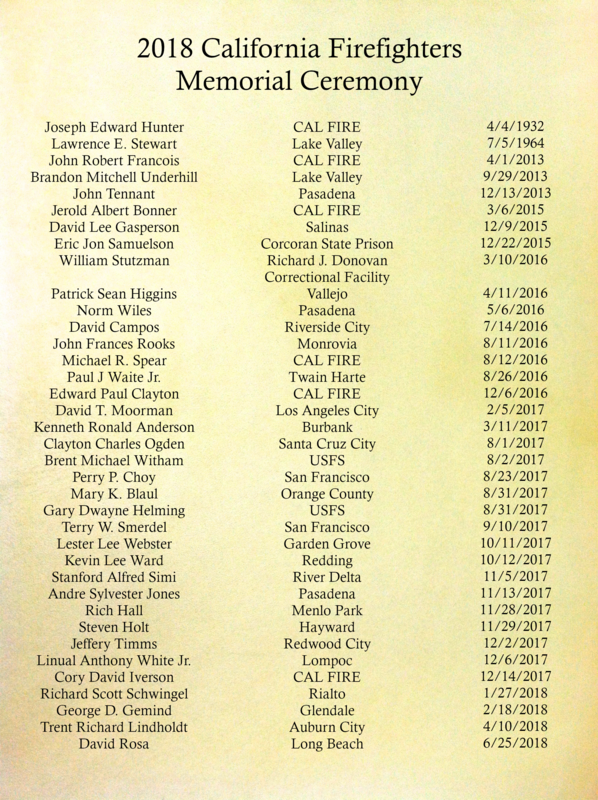 At this year's memorial service, the IAFF will add 271 fallen fire fighters from the United States and Canada to the Wall of Honor. Sara began her 16 year firefighting career on May 15, 2000 as a Firefighter I and spent the next 8 years working for CAL FIRE in the San Diego, San Benito-Monterey and Riverside Units. Sara promoted to the rank of Firefighter II in the Riverside Unit where she spent most of her career serving the citizens of the Coachella Valley until her passing. Sara is remembered by her friends and co-workers as a loving mother and a genuine person that was always willing to help anyone in need. Sara typifies what it means to be a firefighter and what they represent. Peers said Thomas had a strong presence behind the scenes and often played the part of "mama bear" who looked after her cubs. She both cared for and scolded her cubs when they stepped out of line. Sara was an amazing warrior, and she fought to the very end. She is survived by her husband, and daughters, and will be dearly missed by her family and friends. Sara Thomas, a 41-year-old CAL FIRE Firefighter passed away on January 31, 2017 after a yearlong and courageous battle with job related cancer. Julie Freeman always looked out for the people around her, treating them with respect and caring, and was attracted to the family feeling of the fire service, making the team effort: belonging to something greater than herself. Julie began her career with CAL FIRE in 1997 and selflessly dedicated more than two decades of her like to protecting the people of the State of California, serving as a Dispatcher, Seasonal Firefighter, and Fire Apparatus Engineer; working as she progressed in her career in the Fresno-Kings, Madeira-Mariposa-Merced, and San Benito-Monterey Units, then achieving the rank of Fire Captain and spending the last 8 years at Carmel Hill Fire Station in Pebble Beach. Julie was a valued member of CAL FIRE Incident management Team 6, was a CAL FIRE Local 2881 Chapter Director, was a dedicated member of the CAL FIRE Local 2881 Honor Guard for many years and receiving the "Executive Board Award for Dedication and Sacrifice to the Members of Cal Fire Local 2881". Julie loved travel, planning trips, and spending time with friends, and was a lifelong baseball fan - Go Giants! Cory David Iverson, began his fire service career in 2008 as a volunteer firefighter with the Elfin Forest - Harmony Grove Fire Department in San Diego County. In 2009, Cory accepted an offer for a Firefighter I position with the Riverside Unit of CAL FIRE. During that time, his most treasured assignment was as a Firefighter assigned to Helicopter 301 out of the Hemet-Ryan Air Attack Base. In 2012, he spent one season as a Federal Firefighter with the Bear Divide Hotshot Crew before returning to the airbase in 2013. This was also the year that he met the love of his life, Ashley. They were married in 2014 and began his most important role as husband and daddy. In 2015, Cory and Ashley became the proud parents to their first born daughter, Evie Rose. Two months later, Cory accepted a promotion to Fire Apparatus Engineer and spent one year in the Tuolumne-Calaveras CAL FIRE Unit before accepting a permanent FAE position in the Monte Vista Unit assigned to Dulzura Station 30. In 2017, Cory was elated to learn he would be a daddy again to another little girl, who he unfortunately was never able to meet. On December 14, 2017, while battling the Thomas Fire in Ventura County, Cory was overrun by fast moving flames and perished. Cory was known for his dedication, incredible worth ethic and passion for the job. He was highly respected by all his coworkers and he helped mentor and inspire all who crossed his path. Cory's wife Ashley, with their two girls by her side, has created the Iverson Foundation for Active Awareness (IFAA) in his memory to help continue his impact on the world. With increased awareness and discussion around post-traumatic stress in the fire service, it's important to know what post-traumatic stress is and what it's not. While the term post-traumatic stress (sometimes called PTS) is often used interchangeably with the term post-traumatic stress disorder (PTSD), the two are quite different. At some point in their career, most fire fighters and paramedics will experience post-traumatic stress, while only a relatively small fraction of these individuals will develop the mental health disorder known as PTSD. The fact remains that fire fighters and paramedics are an extremely resilient population. Post-traumatic stress is a normal reaction to any event that threatens violence or the loss of life. You may personally experience the event, see the event occur to someone else or have direct exposure to aversive details of the event in its aftermath. Post-traumatic stress is NOT recognized as a mental health disorder and often requires no treatment intervention. Symptoms usually subside within a few days or weeks and do not significantly impair daily functioning. When I was a young firefighter in the early 1980s, my department did not carry any kind of drinking water supply on the rigs. Individuals could stash a water bottle in their seats, but more often than not, we would be out for hours on a searing summer day with no access to fluids in any form. That situation changed over the years - every engine and truck began carrying a large cooler jug full of water, and the battalion chief always had a case of sports drinks in his truck. But it was still extremely difficult to stay adequately hydrated at work, and we all suffered the consequences. A 30-year-old man serving a prison sentence for running down a firefighter with an SUV in the Richmond District will now face a murder charge after the victim died from injuries related to the hit and run, according to authorities. The District Attorney's Office said Eduardo Chaparro-Esquivel is expected to be arraigned Thursday on a single count of murder in connection with the death of Albert Bartal, a 35-year-old former Cal Fire firefighter and Marine who died April 17. Jurors convicted Chaparro-Esquivel of various charges including torture in 2015 for hitting Bartal with a rented SUV after an argument at a Jack in the Box restaurant at Geary Boulevard and 11th Avenue in 2011.